Think Bio Hazard Trauma & Crime Scene Cleaning for Clandestine Drub Lab Cleaning in Wagga Wagga. The only choice when you need professional Clandestine Drug Lab sterilisation and remediation performed at your Wagga Wagga place of business or residence. 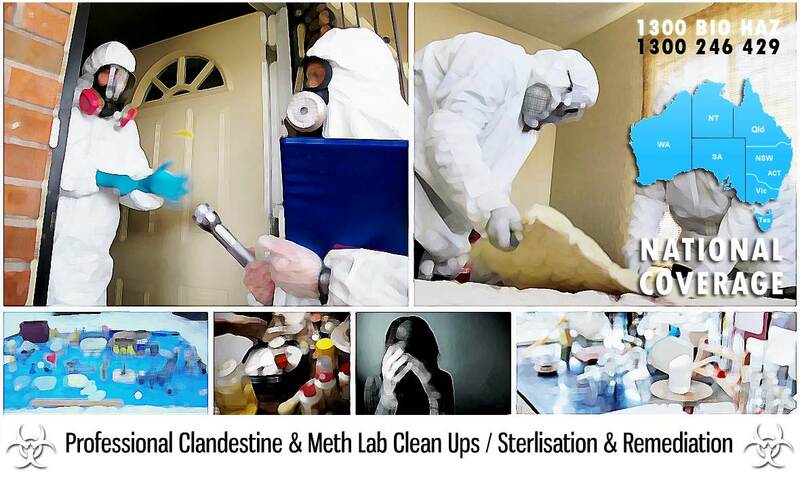 Not only will you be guaranteed a professional clean by our trained, professional Clandestine Drug Lab Cleaners in Wagga Wagga, but you can rest assure that you will have a clean, safe environment to return to, free of any biohazardous materials, contaminants or toxic chemical residue. We use the latest technology to sterilise and neutralise all non-visible chemicals and toxins. As a Clandestine Drug Lab is often far more dangerous then the drugs themselves, our Clandestine Drug Lab Cleaning crew are all very highly trained professionals. Our Clandestine Drug Lab Cleaning Crew in Wagga Wagga will approach your Clandestine Drug Lab clean up with the upmost care and respect for your property. Our Clandestine Drug Lab Cleaning Crew in Wagga Wagga are equipped with all the correct specialist safety equipment and hi-tech remediation gear to have your property back to the way it was before the illegal Drug Lab contaminated your property. We service 100% of Australia including Wagga Wagga.